Formal dollarization clearly eliminates the manipulation of the nominal exchange rate, and reduces significantly the scope for monetary policy. The central bank can still buy and sell bonds, and lend at the discount window, but the amounts are restricted by the amount of their reserves, and as a result the control of the basic interest rate and money supply become fundamentally endogenous. In other words, like in the Gold Standard the international market determines monetary policy. As in the Gold Standard, if there is a persistent deficit in the current account, in the absence of depreciation as a policy instrument, the economy must contract, to reduce the need for imports. Interestingly enough, not only dollarization, reduces almost completely the scope for monetary policy, but also curtails the ability to pursue fiscal policy. In effect, when debt is denominated in domestic currency the central bank, which acts as the fiscal agent of the treasury, can always monetize it. If we leave for aside for now the consequences of monetization (I’ll deal with that in another post), default in domestic denominated debt is not possible, since monetization is always an option. 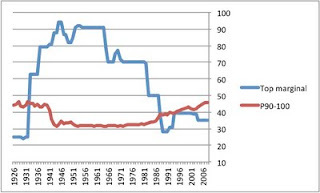 Dollarization transforms all debt (public and private) into foreign debt, and as the central bank cannot print foreign money (if we rule falsification out), default risk is incremented (supposedly in exchange foreign exchange risk vanishes, since nominal depreciation is impossible in a dollarized economy). As result, not only contractionary fiscal policy has to be used to reduce the demand for imports if there are external problems, but also the space for domestic spending (not the external transactions that would always require dollars) becomes limited. An external crisis becomes a domestic fiscal crisis. In most cases, dollarization is forced by market forces (i.e. currency substitution) or is simply the result of a political decision, which can be enforced by authorities that are often in the middle of an external crisis with run away inflation. That was, for example, the case in Ecuador. Interestingly enough El Salvador did not have any significant inflation before dollarization, and the Colón was one of the most stable currencies in Latin America. Also, currency substitution was not widespread, with around 10% of the deposits in dollars by the time of dollarization, while Nicaragua, for example, that did not dollarize had a level of deposit dollarization of more than 50%. 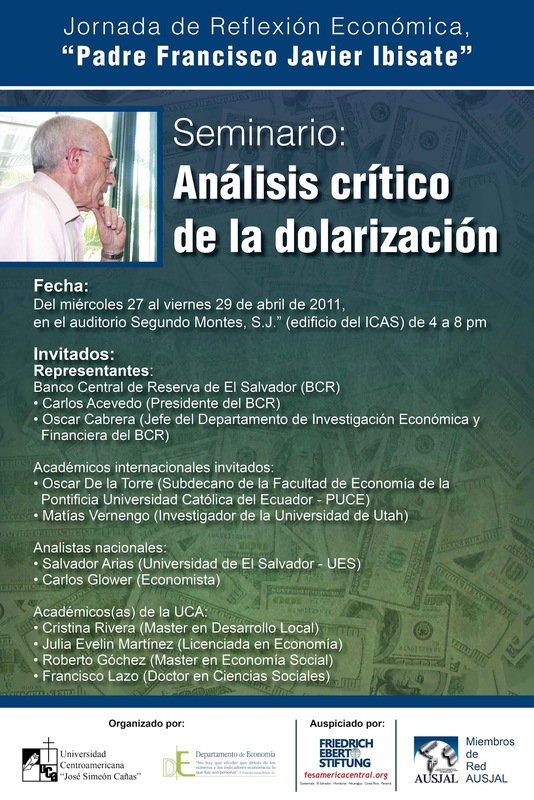 Dollarization in El Salvador can only be understood as part of a larger strategy. Not only is El Salvador dollarized, but also part of the Central American Free Trade Area (CAFTA), a trade a agreement with the US and other Central American countries, and the Dominican Republic. The development strategy is to export people! 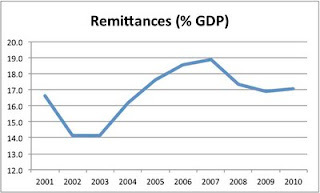 Yes, immigrants become cheap labor in the US and send remittances (which are almost 19% of GDP, see the graph), and foreign capital enters to produce in maquilas for export, exploiting cheap labor at home. Real wages have been low and declining, the real exchange rate appreciated (but not as much as in other countries with fixed rates), and financial remuneration has gone up. 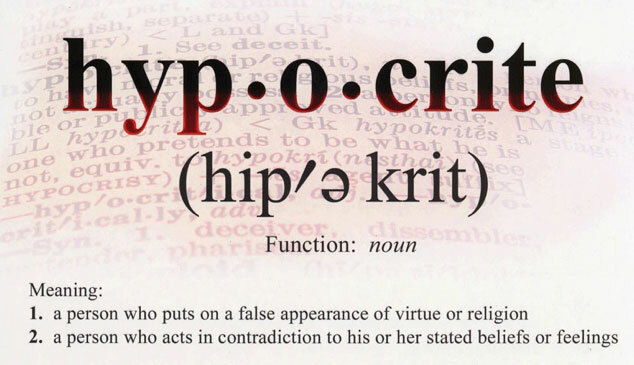 Domestically, this is the strategy of an elite that decided to accumulate financially and in dollars. 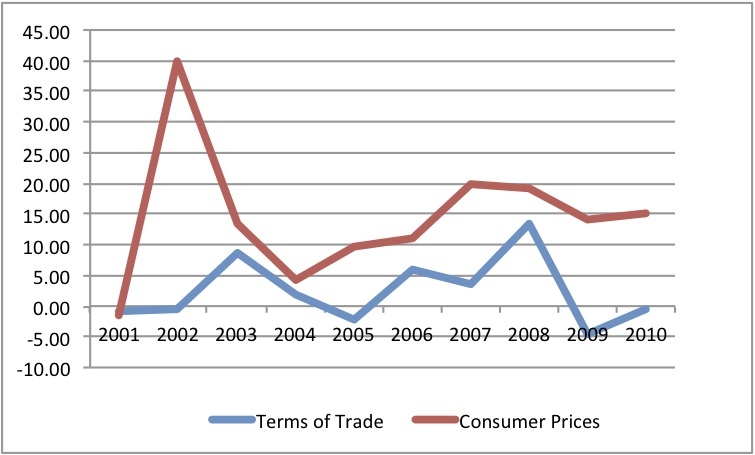 Internationally, this is part of the American strategy of integration with the Western Hemisphere, FTAs and financial liberalization, which implies varying degrees of formal and informal dollarization (By the way if the US approves the FTAs with Colombia and Panama, the whole Pacific coast from Chile to Alaska will be part of a FTA, with the exception of Ecuador, which is formally dollarized). It's been out for a while, but I somehow missed it. Allen & Evans basically argue for a Brady (they call it Trichet) plan for the restructuring of the debt of the European periphery. A 35% haircut and 6.25% interest on new bonds. Will not solve the imbalances at the heart of the problem, but it's a good start. Not sure, however, that we reached the point at which debt restructuring is seen as a necessity. In Latin America in the 1980s it took almost a full decade. The Economist, in their last issue, has come out against it. Hope springs eternal! "The ECB increased the rate of interest – in what is very likely the first one of a series of increases expected in the next months – with the objective of controlling inflation that accelerated to 2.6% in March from 2.4% in February. Given that this inflation bout has external origins, caused by the increase in the international price of energy, raw materials and foodstuff, the reasoning behind the anti-inflation policy based on dear money is not immediately obvious. 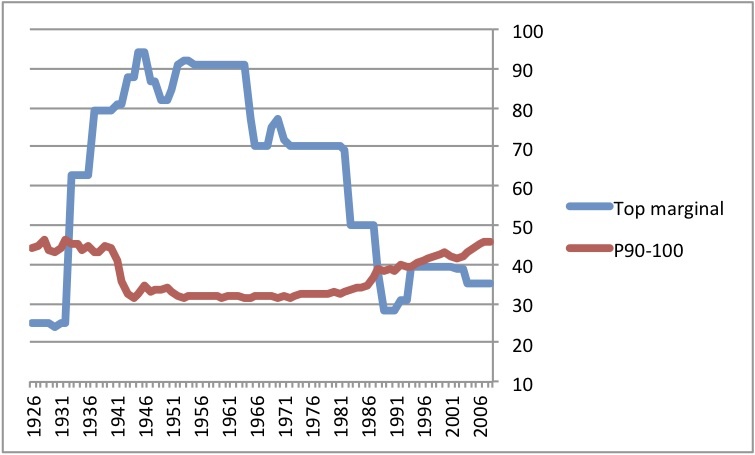 First of all, according to the currently dominant versions of the orthodox point of view about monetary policy, an increase of the rate of interest by the central bank would be only justified if the reasons for the greater inflation including also monetary wages rises would be attributable to imbalances in the conditions of domestic aggregate demand and supply. But certainly not even Trichet would think that today, within euro-system, aggregate demand is pressing beyond the limits of potential product. He goes on to argue that the ECB policy is like trying to put out a fire by throwing gasoline on the flames, since higher rates of interest translate into higher costs, which firms would pass to their prices. He notes correctly that the anti-inflationary impact of this policy comes from the appreciation of the euro, which reduces the cost of imported goods, and the reduced wage pressures from an even more depressed economy. The rest can be read here (if you read in Italian). 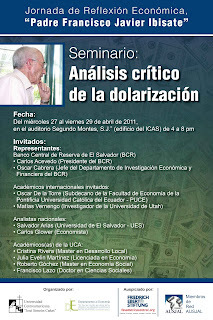 I’m off to El Salvador this week for a conference on dollarization at the Catholic University (Universidad Centroamericana José Simeón Cañas, UCA) with several members of the Central Bank, including the governor. El Salvador has been dollarized since 2001, and in this period it has grown below the Latin American average. 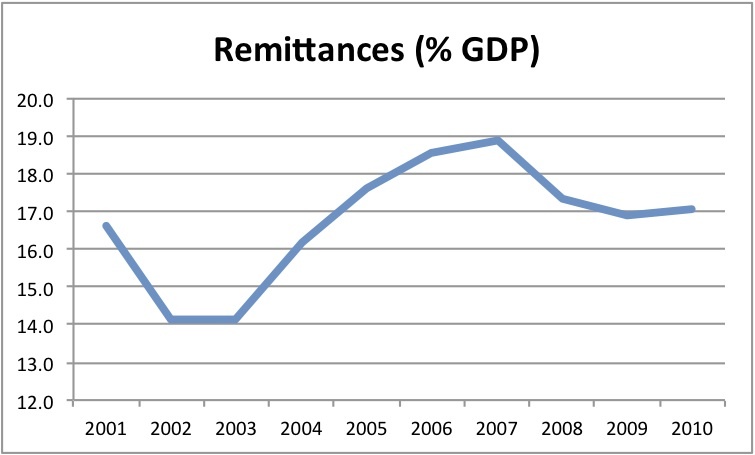 In the 2001-10 period El Salvador grew at a rate of 2% per year while the whole region did at 3.6%. If we look at the boom period (2003-08) the respective numbers are 3.1 and 4.8%. So dollarization seems to be connected to lower growth. No surprise there. Also, inflation has been subdued. The Consumer Price Index (CPI) has changed at 3.5% per year, for the whole period. The immediate effects of dollarization are lower inflation and lower growth. The interesting thing about the Salvadorian case is that, contrary to other experiences of exchange rate based stabilization, inflation was not very high before 2001, and it was very low, in the one digit range, throughout the dollarization. 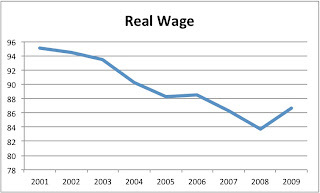 Also, real wages have fallen significantly since 2001, as shown in the figure below. This is pretty striking, since most countries that fix the exchange rate, let alone dollarize, end up having a significant real appreciation (i.e. higher domestic costs than foreign, like in the European periphery). 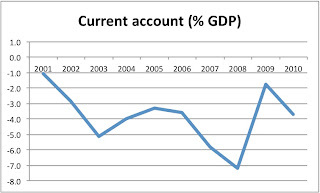 At any rate, even with a smaller real appreciation than otherwise (because of low real wages) the current account deficit has become increasingly larger, and only the global crisis, and the fall of GDP have provided temporary relief. It does not look sustainable in the long run. PS: I have dealt with the Ecuadorian case somewhere else. We need a Public Rating Agency! So Standard & Poor's has revised the outlook of US debt, which is still triple-A, to negative. The reason according to their report is that: they “believe there is a material risk that U.S. policymakers might not reach an agreement on how to address medium- and long-term budgetary challenges.” Basically, the economic rationale is simply that the fiscal consolidation (read contraction) plans are not strong enough. Somebody should explain to them that the US cannot default on debt denominated in dollars. There is always recourse to monetization of debt in your own currency. And yes monetization may have consequences. But, monetization would only lead to inflation if the economy were at full employment. I wish we were there, and excess demand could lead to inflation. But at this point it’s pure delusion. Note, however, that all the Rating Agencies (S&P's, Moody’s and Fitch) argue, to protect against lawsuits, that their ratings are nothing more than opinions. By the way, the opinions of people that rated subprime CDOs (Collateralized Debt Obligations) as triple-A. These are the opinions of highly unqualified people at best, or worst just completely dishonest. It would be nice if we could just dismiss their ‘opinions’ as the ranting (not ratings) of lunatics and common thieves, but that would be dangerous. 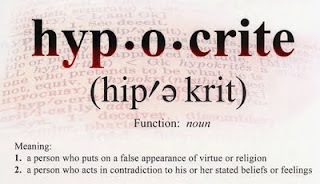 In fact, their views are not just opinions, and their argument is disingenuous at best. The problem is NOT that investors actually pay attention to their ratings, which they do. Worse than that, financial regulations incorporate their ratings and require, for example, that money-market funds have to invest in instruments with high credit ratings. Several laws require pension funds to meet certain credit-rating requirements, and banking regulations determine regulatory capital requirements based on the credit ratings of the securities the bank owns. In other words, the credit agencies have a semi-public status, but they are profit-making businesses, which have a proven record of incompetence (when it comes to risk assessment, not profit-making). This is the strongest case for creating a public rating agency that would be free from the conflicts of interest that the private agencies are so obviously entangled into. Tax week provided a lot of discussion of income distribution, and the effects of taxation on increasing inequality in the US. 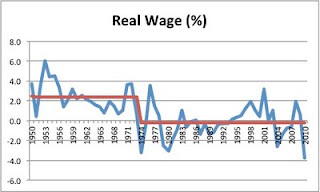 I just wanted to post these two graphs that show the evolution of real wages in the US, since 1950, and real long-term interest rates in the same period. 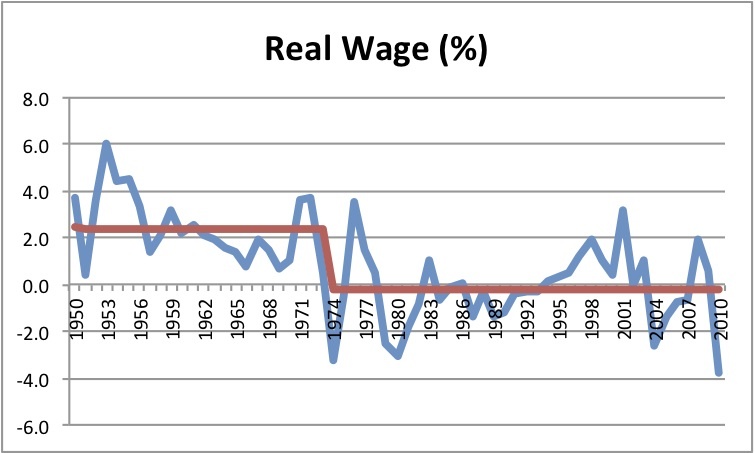 The red lines are the averages for different periods (first periods are 1950-73 for wages, and 1950-79 for interest). 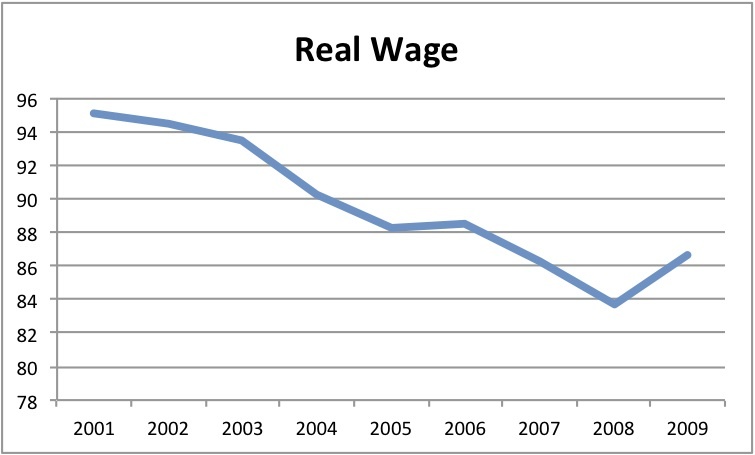 The average growth of real wages in the first period was 2.4% per year, falling to -0.2% subsequently. For interest rates the values are 2.1% and 4.6% respectively. If you think that the increase in interest rates is not that big, think that if you invest $100 at 2.1% after 30 years you get approximately $186, while at 4.6% you receive close to $385. That’s the meaning Keynes’ revenge of the rentier. PS: All the data is available here. Great website by Sam Williamson. This Friday 1:30 at the U's Econ Dept (JJR Library). Naked Keynesian Steve Bannister will present! If you're Bayesian curious don't miss it. "Unfortunately the IMF's practice still does not match its rhetoric or even, increasingly, its own research. In Greece, Ireland, Spain, Portugal, Latvia and other countries, the Fund is still involved in the implementation of 'pro-cyclical' policies that will keep these countries from recovering for a long time." How do you call a person (or institution) that says one thing, but then does another?! There will be a screening of Inside Job at the Hinckley Caucus Room in Orson Spencer Hall (OSH Rm 255) Wednesday at 1:30. Here are Jamie Galbraith's remarks on April 15 in New York at the Levy Economics Institute's 20th annual Hyman Minsky conference. The topic was financial fraud. It must be hard to be a Monetarist! In other words, money supply is never significant, output very seldom, and the only thing that really matters is past inflation. So much for monetarist views according to which money supply explains economic history! In the face of this paper, the only puzzling question is why the Monetarist view of history, as expressed in Friedman & Schwartz, and more recently in Meltzer, is still so popular. There explicit conclusion is that: “the results reported in this column are consistent with the idea that a policy regime which successfully stabilizes inflation makes it harder to improve upon the forecasts based on “naive” models.” English translation: the conventional idea that too much demand triggered by monetary expansion causes inflation does not work when compared to the simple idea of inflationary inertia. Inflation is high if it was high in the past. The first period in which output growth has predictive power is, incidentally, a period in which commodity prices boomed, and that means that inflation might be orthogonal to output growth, even if both are correlated. The second period was associated to both a stock market and a housing bubble, and asset price inflation may also not result from full employment (output increasing beyond its potential). They should have explicitly noted that periods (monetary regimes) with low inflation could not be explained simply by lack of excess demand or monetary expansionism, since those are ruled out by their own econometric work. I wonder what explains monetary regimes that produce price stability? Interestingly enough the authors do not seem to have an interest in what causes past inflation or price stability! PS: Thanks to Steve Bannister for directing me to their post. He may have something to say later on the advantages and the limitations of the econometric techniques used by the authors. Also, he is giving a talk on heterodox approaches to econometrics this coming Friday. Will post a link to his talk later. A little aside prompted by the top marginal rate graph I posted yesterday. If you graph it together with the share of income of the top 10% of the population (data available in Emmanuel Saez’s webpage), you see that as the top marginal rate goes up in the 1930s the income share of the wealthiest individuals falls, and vice versa in the 1980s. 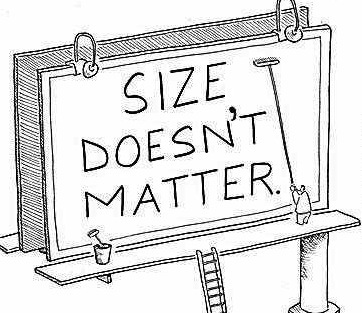 Not rocket science. And clearly there are several other factors that explain the down and up change in the income share of the wealthiest, from the strength of unions after the Wagner Act and their current struggles (e.g. in Wisconsin), to the education boost of the GI Bill and the current increases in the cost of public education, to the political changes in the Republican Party after the rise of the conservative movement. 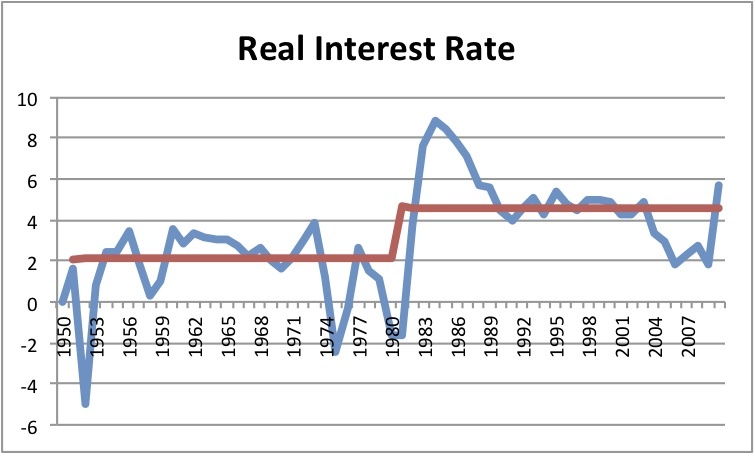 PS: I excluded the earlier years of the 20th century, because of the sharp increases in top rates during World War I. Doing my taxes (yep another procrastinator) and getting the little Tea-bagger (talk about darker side!) inside me a bit angry. Just read this week David Cay Johnston's great piece for the Willamette Week debunking the myths about taxes (e.g. the rich pay most of the taxes, but not really, just most of the income tax, and so on). He shows that the worker making the median wage pays around 23% of his/her income as compared to almost 19% for the 400 wealthiest Americans (See Table below). If that does not lend support to Obama's proposal to allow the top rate to increase again to 39.6%, I don't know what does. The graph below (via thruth&politics) shows the top marginal tax rate over time. We do not need to go back to the good old times of that Socialist, Eisenhower, when marginal tax rates where 91%, but it would certainly help to raise taxes on the rich, if you are really concerned about public debt. It seems that class warfare wasn't that bad! This video of the old series by John Kenneth Galbraith is fantastic. The other parts are also available. A little nugget in the begging is the video of John Maynard Keynes. In an era of gold bugs, a good reminder of why the Gold Standard did not work. Moby and MoveOn.org against the budget deal. A bit dramatic, but right on target. Krugman shows that according to a paper on the Chicago Fed, there is no evidence of a connection between core inflation (without energy and food prices) and commodity prices. He should have said no evidence in the United States. In fact, when you look at developing countries the connection might be stronger. That depends on the pass-through effect from commodity (tradables) prices to non-tradables. Also, note that the Consumer Price Index (CPI) would be affected. 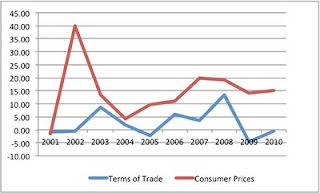 For example, if we look (see graph above) at the Argentine data (using terms of trade and consumer prices) there is a clear effect of commodity prices on CPI inflation. That does not mean that I would favor hiking rates of interest, and putting a break, in the US or Argentina for that matter, on expansionist policies. Quite the opposite, the suggestion is that policies to stabilize the wild fluctuation of commodity prices, for starters try to control the speculation with commodity derivatives, might be a good idea. According to the New York Times we barely averted the government shutdown to move on to the war over the debt-ceiling limit. Tim Geithner has argued that the government will hit, no later than May 16, the federal debt-ceiling limit of US$ 14,2 trillion. In fact, contrary to what one might expect the debt-ceiling limit is often increased. The question, of course, is whether the increase in debt vis-à-vis the capacity to repay, normally measuring debt as a share of GDP, is of such magnitude that the economy is doomed. When we hit the limit, federal public debt will be slightly below the 100% mark. Historically, is not the highest debt-to-GDP level in the US, neither unprecedented by historical standards. The graph below shows British debt-to-GDP from 1692 to 2011. 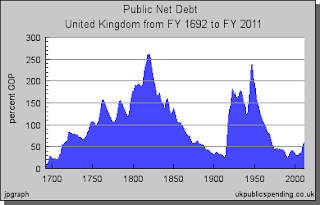 The peak in British debt, at the end of the Napoleonic wars, was about 260%, and it had grown consistently during the 18th century. David Hume argued in 1752 that: “either the Nation must destroy public credit, or public credit will destroy the Nation.” He was obviously wrong (that’s probably why his theories are still taught by economists!). Not only public debt, which is what he meant by public credit, did not bankrupt the UK, but also it allowed for an Industrial Revolution and the victory in the hegemonic wars against France. A pile of debt laid the foundations for the Victorian economy boom and world dominance. Note that during the 18th century the UK had higher taxes to pay for the higher debt levels than France, but interest rates were considerably lower, which implied that the burden of debt (interest payments out of total spending) was not much bigger than in France. James MacDonald has a very good book on the British debt history. This suggests that more important than the growing debt-to-GDP ratio in the US is how it is used, and how it is funded. The function of the deficits and debt is more important than the size, as Abba Lerner argued. Hence, if we spend money to create jobs (e.g. remaking the infrastructure) and tax the rich rather then cut spending on programs for the poor, increasing the debt-ceiling limit should be a no-brainer. As Matías pointed out in a previous post, Yilmaz Akyüz describes the stylized post-Bretton Woods boom and bust cycle nicely. From the perspective of the developing world, low interest rates in the US lead to an inflow of capital, currency appreciation, and often times a commodity price bubble. 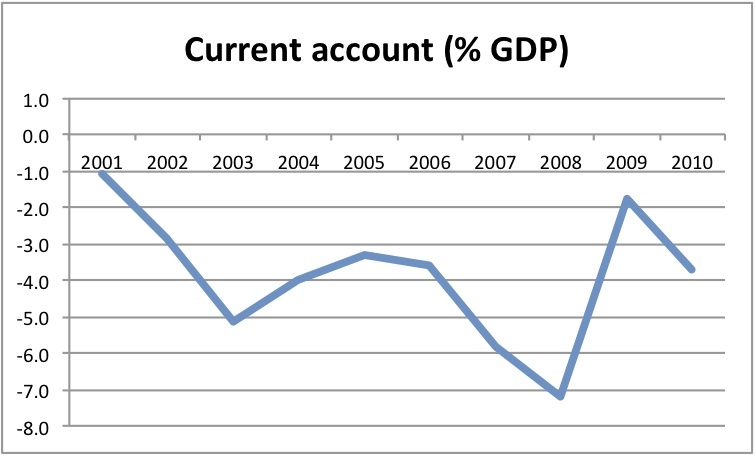 As the current account worsens, a trigger event causes a sharp withdrawal of capital (which often results in a debt crisis). Reductions in the level of income then adjust the balance of payments. From the perspective of the US, this has been associated with debt driven consumption cycles. But the post-Bretton Woods US is only the most recent protagonist in what was originally a British drama. Throughout the 19th century, the British, often responding to rising commodity prices, pulled "gold from the moon" by manipulating the Bank of England discount rate. From the Baring Crisis of the 1890's to the 1860's cotton boom in Egypt, to the US boom of the 1830's, to the first Latin American debt crisis in the 1820's, the British were able to direct the international flow of capital and thus the fates of peripheral countries. The cycle is astoundingly similar. Long periods of disinflation in the center, associated with capital inflows and commodity booms in the periphery. Peripheral exchange rates appreciate, a large external account deficit opens, and the whole process is ended with a sharp increase in interest rates by the central bank in the core. The example of the US in the late 1830's is particularly ironic as it learned some harsh lessons in the school of international financial hegemony that it now conducts. Long term capital began to flow into the US after during the British recovery of 1833-34. It was associated with a rapid increase in commodity prices, particularly cotton. As the dollar appreciated against the pound, a large trade deficit emerged, as Americans bought British manufactured goods. A decline in the British bank rate in 1835 further increased the mania. By 1836 the Bank of England increased it's discount rate, causing commodity prices to collapse and throwing the US into recession. High real interest rates then resulted in a wave of US state defaults not unlike the Latin American defaults of decade earlier (notably Andrew Jackson had paid of the federal debt with revenues from land sales - else we might have had a full on sovereign default!). All of which is to say that the cycle is not new. Even prior to the classical gold standard, the center has conducted the orchestra, while the periphery faces strongly asymmetric adjustments. It is however ironic that a country that used to be in a minor chair position now conducts. The difference of course is that as the 19th century came to a close and international competition mounted, the British turned inwards, increasing trade with countries within the Empire (as pointed out in DeCecco's fantastic book "The International Gold Standard: Money and Empire"). 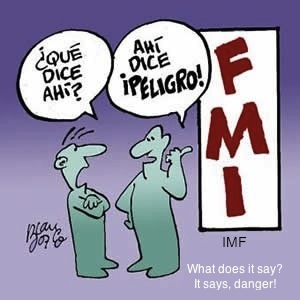 Is there something in the water at the IMF? Whilst I haven't yet taken the time to delve into the 'metrics, this looks to be an interesting survey and addition to one of the fundamental macro questions: whence growth. Interestingly, the authors highlight the finding of the importance of (the lack of) inequality for continuation of "growth spells." Given its history, it's fairly stunning that this would emanate from the IMF. Further, I think it's time to do a really good syllabus on the topic of growth and inequality. Inequality mavens, send us your links! I'll be reading this one more closely, especially in the context of Matias' immediately preceding post. Yilmaz Akyüz has written a very good post on the boom and bust cycles in the periphery or the less developed countries, resulting from long-term capital inflows and outflows coming from the center or developed countries. He notes that we are entering a fourth cycle since the collapse of Bretton Woods. The basic mechanism can be described as follows, a crisis in the center, which leads to low rates of growth and interest rates, creates the conditions for inflows of capital into the periphery. The inflows, in turn, lead to a boom in the periphery that goes hand-in-hand with currency appreciation, and in some cases greater indebtedness and asset and commodity price bubbles. The appreciation weakens the external position in the periphery, and eventually something (e.g. higher interest rates in the center, a fall in the price of commodities, etc.) triggers a reversal of capital flows and a crisis in the periphery. It must be noted that the three previous cycles, to which Akyüz refers, can be also observed in the US economy. The cycles in the periphery have been associated in the US to three debt-led cycles in which the boom was associated to appreciation of the currency, and asset bubbles that allowed consumption to increase, in spite of the stagnation of wages. Arguably, it is the American boom and bust cycles that drive the flows of capital, and the cycles in the periphery. So Raúl Prebisch still has a lot to teach us on the interaction between the center and the periphery! The Laws of Human Stupidity imply that non-stupid people underestimate the damaging effects of idiots. In particular, if there is an increasing number of bandits within the elite of the country (e.g. 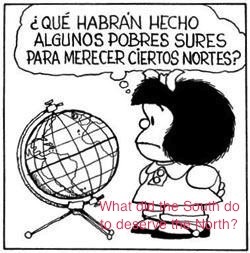 Republicans and his plutocratic friends) that want to plunder the budget, cutting taxes for the rich and cutting spending for the poor and the elderly, and a large number of idiots (e.g. the Tea Party), with only helpless people (e.g. the Democratic leadership) to avoid catastrophe, then as Cipolla suggested society is sure to go to Hell! Via Naked Capitalism. This is not very recent, but worth your time. This is harsh critique from a public intellectual that was, and still is in many respects, pro-Obama. And yes he is right we DO need a New New Deal. The new labor report is out (here) and the news... well there aren't any news really. 216,000 jobs created, which is barely above what is needed to deal with the growth in the labor force. The unemployment rate is down to 8.8%, and the average duration of unemployment is up to 39 weeks. Meanwhile Nero (I mean Republicans) play the fiddle while Washington burns, err I mean shuts down. The Economic Policy Institute (EPI) provides in depth analysis here.